Warwickshire ( /ˈwɒrɪkʃər/ or /ˈwɒrɪkʃɪər/) is a landlocked non-metropolitan county in the West Midlands region of England. The county town is Warwick, although the largest town is Nuneaton. The county is famous for being the birthplace of William Shakespeare and George Eliot. Commonly used abbreviations for the county are Warks or Warwicks. For Eurostat purposes it is a NUTS 3 region (code UKG13) and is one of three counties that comprise the "Herefordshire, Worcestershire and Warwickshire" NUTS 2 region. Warwickshire is bounded to the north-west by the West Midlands metropolitan county and Staffordshire, by Leicestershire to the north-east, Northamptonshire to the east, Worcestershire to the west, Oxfordshire to the south and Gloucestershire to the south-west. The northern tip of the county is only 3 miles (5 km) from the Derbyshire border. 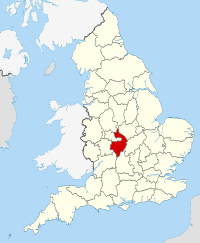 An average-sized English county covering an area of almost 2,000 km2, it runs some 60 miles (97 km) north to south. The majority of Warwickshire's population live in the north and centre of the county. The market towns of northern and eastern Warwickshire were industrialised in the 19th century, and include Atherstone, Bedworth, Nuneaton, and Rugby. Major industries included coal mining, textiles, engineering, and cement production, but heavy industry is in decline, being replaced by distribution centres, light to medium industry, and services. Of the northern and eastern towns, only Nuneaton and Rugby (as the birthplace of rugby football) are well-known outside of Warwickshire. The prosperous towns of central and western Warwickshire including Royal Leamington Spa, Stratford-upon-Avon, Kenilworth, Alcester, and Warwick harbour light to medium industries, services and tourism as major employment sectors. The south of the county is largely rural and sparsely populated, and includes a small area of the Cotswolds, at the border with northwest Gloucestershire. The only town in the south of Warwickshire is Shipston-on-Stour. The highest point in the county, at 261 m (856 ft), is Ebrington Hill, again on the border with Gloucestershire, grid reference SP187426 at the county's southwest extremity. The north of the county, bordering Staffordshire and Leicestershire, is mildly undulating countryside and the northernmost village, No Man's Heath, is only 34 miles (55 km) south of the Peak District National Park's southernmost point. There are no cities in Warwickshire since both Coventry and Birmingham were incorporated into the West Midlands county in 1974 and are now metropolitan authorities in themselves. 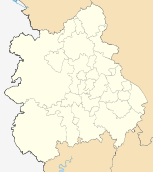 The largest towns in Warwickshire as of 2004 are: Nuneaton (pop. 77,500), Rugby (62,700), Leamington Spa (45,300), and Bedworth (32,500). Stratford, Warwick, and Kenilworth all house 20,000-25,000 inhabitants, while the smaller towns of Atherstone, Alcester, Coleshill, Southam, Bulkington, Polesworth, Kingsbury, Henley-in-Arden, Studley, Shipston. Wellesbourne and Whitnash have populations between 5,000 and 12,000. Much of western Warwickshire, including that area now forming part of Coventry, Solihull and Birmingham, was covered by the ancient Forest of Arden (most of which was cut down to provide fuel for industrialisation). Thus the names of a number of places in the northwestern part of Warwickshire end with the phrase "-in-Arden", such as Henley-in-Arden, Hampton-in-Arden and Tanworth-in-Arden. The remaining area, not part of the forest, was called the Felden - from fielden. Areas historically part of Warwickshire include Coventry, Solihull, Sutton Coldfield and most of Birmingham including Aston and Edgbaston. These became part of the metropolitan county of West Midlands (and Sutton Coldfield became part of Birmingham) following local government re-organisation in 1974. In 1986 the West Midlands County Council was abolished and Birmingham, Coventry, and Solihull became effective unitary authorities, however the West Midlands county name has not been altogether abolished, and still exists for ceremonial purposes, and so the town and two cities remain outside Warwickshire. Some organisations, such as Warwickshire County Cricket Club, which is based in Edgbaston, in Birmingham, still observe the historic county boundaries. Coventry is effectively in the centre of the Warwickshire area, and still has strong ties with the county. Coventry and Warwickshire are sometimes treated as a single area and share a single Chamber of Commerce and BBC Local Radio Station (BBC Coventry & Warwickshire). Coventry has been a part of Warwickshire for only some of its history. In 1451 Coventry was separated from Warwickshire and made a county corporate in its own right, called the County of the City of Coventry. In 1842 the county of Coventry was abolished and Coventry was remerged with Warwickshire. In recent times, there have been calls to formally re-introduce Coventry into Warwickshire, although nothing has yet come of this. The county's population would increase by almost a third-of-a-million overnight should this occur, Coventry being the UK's 11th largest city. The town of Tamworth was historically divided between Warwickshire and Staffordshire, but since 1888 has been fully in Staffordshire. In 1931, Warwickshire gained the town of Shipston-on-Stour from Worcestershire and several villages, including Long Marston and Welford-on-Avon, from Gloucestershire. The following towns and villages in Warwickshire have populations of over 5,000. Warwickshire came into being as a division of the kingdom of Mercia in the early 11th century. The first reference to Warwickshire was in 1001, as Wæringscīr named after Warwick (meaning "dwellings by the weir"). During the Middle Ages Warwickshire was dominated by Coventry, which was at the time one of the most important cities in England due to its textiles trade in the heart of England. Warwickshire played a key part in the English Civil War, with the Battle of Edgehill and other skirmishes taking place in the county. During the Industrial Revolution Warwickshire became one of Britain's foremost industrial counties, with the large industrial cities of Birmingham and Coventry within its boundaries. 1844: The Counties (Detached Parts) Act transferred a township to, and two parishes from, the county. 1888: Those parts of the town of Tamworth lying in Warwickshire were ceded to Staffordshire. 1891: Harborne became part of the County Borough of Birmingham and thus was transferred from Staffordshire to Warwickshire by the Local Govt. Bd. 's Prov. Orders Conf. (No. 13) Act, 54 & 55 Vic. c. 161 (local act). 1891: The district of Balsall Heath, which had originally constituted the most northerly part of the Parish of King's Norton in Worcestershire, was added to the County Borough of Birmingham, and therefore Warwickshire, on 1 October 1891. 1909: Quinton was formally removed from Worcestershire and incorporated into the County Borough of Birmingham, then in Warwickshire, on 9 November 1909. 1911: The Urban District of Handsworth, in Staffordshire, and the Rural District of Yardley along with the greater part of the Urban District of King's Norton and Northfield, both in Worcestershire, were absorbed into Birmingham, and thus Warwickshire, as part of the Greater Birmingham Scheme on 9 November 1911. 1928: Perry Barr Urban District was ceded to Birmingham from Staffordshire. 1931: The boundaries between Gloucestershire, Warwickshire, and Worcestershire were adjusted by the Provisional Order Confirmation (Gloucestershire, Warwickshire and Worcestershire) Act which transferred 26 parishes between the three counties, largely to eliminate exclaves. The town of Shipston-on-Stour was gained from Worcestershire and several villages, including Long Marston and Welford-on-Avon, from Gloucestershire. 1974: Under The Local Government Act 1972, Birmingham, Coventry, Solihull and Sutton Coldfield were ceded to the new West Midlands county, with Sutton Coldfield becoming part of Birmingham. This is a chart of trend of regional gross value added of Warwickshire at current basic prices published (pp. 240–253) by Office for National Statistics with figures in millions of British Pounds Sterling. Video game developing company Codemasters is based in Warwickshire. Like most English shire counties, Warwickshire has a two-tier structure of local government. Warwickshire is divided into five districts each with their own district councils. These districts are: North Warwickshire, Nuneaton and Bedworth, Rugby, Stratford, and Warwick (see map). The county and district councils are responsible for providing different services. Atherstone is the headquarters of the North Warwickshire district, Nuneaton is headquarters of the Nuneaton and Bedworth District and Leamington Spa is the headquarters of the Warwick district. In addition many small towns and villages have their own parish councils although these have only limited powers. Warwickshire is policed by the Warwickshire Police. The 2009 County Council elections resulted in a win for the Conservatives. The county also has a county council based in Warwick which is elected every four years (the last election was held on 4 June 2009 the same day as the European Elections), is currently controlled by the Conservative Party and operates a cabinet-style council. The county council is made of 62 councillors, who decide upon the budget and appoints the council leader. The council leader selects 2 to 9 councillors and together they form the cabinet. The Leader assigns portfolios on which cabinet members make decisions. Key decisions are made by the whole cabinet while others are made only by the portfolio holders for relevant areas. In the state sector, children start school in the school year in which they turn five. They stay at primary school for seven years (although this varies even within the county, as some people have previously gone for four years and then spent another four years at a 'middle school') until they are eleven. Warwickshire is one of the few local authorities in England to still maintain the Grammar school system in two districts: Stratford on Avon and Rugby, although Southam claims to have a comprehensive school. In the final year of primary school, children are given the opportunity of sitting the eleven plus exam in order to compete for a place at one of the Grammar schools, with two in Stratford and Rugby and one in Alcester (including Stratford-upon-Avon Grammar School for Girls; King Edward VI School, a boys school; and Alcester Grammar School (mixed)). The exam is sat on three different days and consists of two verbal reasoning and mathematics papers and one extended writing paper. In order to maintain standards, there is a bank of papers that are used in rotation. In 2006, it was revealed in a local newspaper, the Stratford Herald, that some private eleven plus tutors had copies of the exam papers and that they were using them as practice papers for their pupils. This meant that, in some cases, pupils sitting the exam had seen the paper in advance. It should be noted that Warwickshire contains 3 Further Education Colleges and 1 6th Form College, North Warwickshire & Hinckley College which has main colleges based in Nuneaton and the Leicestershire Town of Hinckley with smaller colleges based around North Warwickshire, King Edward VI Sixth Form College (K.E.G.S) in Nuneaton, Stratford Upon Avon College and Warwickshire College, an institution made up of six main separate colleges that have merged (Leamington Centre, Rugby Centre, Moreton Morrell Centre, Pershore College, Henley-in-Arden Centre, and the Trident Centre in Warwick). There are also five independent schools within the county, namely; Rugby School, Warwick School, Princethorpe College, Kingsley School in Leamington Spa, and The King's High School For Girls, Warwick. King Edward VI School, Stratford-upon-Avon, Rugby School, Warwick School and Southam College are arguably the four most notable schools within Warwickshire, with King Edward VI School Stratford-upon-Avon still using 13th century school buildings and being the likely school of William Shakespeare, Rugby School being founded in 1567 and Warwick School originally being founded c.914 AD, which makes it the oldest surviving boys school in the country. All three schools achieve very impressive exam results and benefit from exceptional facilities. Rugby School is one of nine schools that were defined as the "great" English public schools by the Public Schools Act 1868, and is a member of the Rugby Group. Both Rugby School and Warwick School are HMC schools, with the Headmaster from each school attending the Headmasters' and Headmistresses' Conference. In 2011, Warwickshire members of the union NUT supported action by staff at Coventry's Tile Hill Wood School, in opposition to the government's programme of Academies. The M40 motorway which connects London to Birmingham, runs through the centre of the county, and serves Leamington Spa, Warwick, and Stratford. The M6 motorway, which connects northwestern England and the West Midlands to the M1 motorway (and then on to London), runs through the north of Warwickshire, and serves Rugby, Nuneaton, and Bedworth on its way to Birmingham. The M69 Coventry to Leicester motorway which serves Nuneaton. Other motorways pass briefly through Warwickshire including the M45 (a short spur south of Rugby connecting to the M1), the southern end of the M6 Toll, and the M42 which passes through the county at several points. Other major trunk routes in Warwickshire includes the A45 (Rugby-Coventry-Birmingham and east into Northamptonshire route). The A46 (connects the M40 to the M6 via Warwick, Kenilworth and Coventry), the A452 (Leamington to Birmingham route) and the A5 runs through Warwickshire passing Nuneaton between Tamworth and Hinckley (at Atherstone). Two major railway lines pass through Warwickshire. The Chiltern Main Line, the former Great Western route from London to Birmingham passes through the centre of Warwickshire on a route similar to the M40 motorway, and has stations at Leamington Spa, Warwick, (and Warwick Parkway) and Hatton. Rail services are provided by Chiltern Railways and London Midland (Birmingham to Leamington only). There are also two branches off the Chiltern line, one from Leamington to Coventry, and another from Hatton near Warwick to Stratford. The West Coast Main Line (WCML) runs through Warwickshire. At Rugby the WCML splits into two parts, one runs west through to Coventry and Birmingham, and the other the "Trent Valley Line" runs north-west towards Stafford and the north-west of England. This section has stations at Nuneaton, Atherstone, and Polesworth (North bound services only). There is one branch off the WCML from Nuneaton to Coventry, and there is a station at Bedworth on this branch. Other railway lines in Warwickshire include the Birmingham-Nuneaton section of the Birmingham to Peterborough Line, which continues east of Nuneaton towards Leicester and Peterborough. Nuneaton has direct services to Birmingham and Leicester on this line, and there is one intermediate station at Water Orton near Coleshill in the extreme north-west of the county. There is also a branch line from Birmingham to Stratford-upon-Avon. This line used to continue southwards to Cheltenham but is now a dead-end branch. There are several stations on this line at Henley-in-Arden and at several small villages. Stratford also has direct rail services to London via the branch line to Warwick (mentioned earlier). The only major town in Warwickshire not to have a station is Kenilworth. Although the Leamington to Coventry line passes through the town, its station was closed in the 1960s as part of the Beeching Axe. There is a concerted campaign to re-open the station, although currently there are no local services operating on the line, as it is used only by CrossCountry services. Coventry Airport is located in the Warwickshire village of Baginton. The Grand Union Canal, which runs through Leamington and Warwick and onwards to Birmingham. The Coventry Canal which runs through the north of the county from Coventry through Bedworth, Nuneaton, Atherstone, and Polesworth, and then onwards to Tamworth. The Stratford-upon-Avon Canal which runs from the Grand Union west of Warwick to Stratford. The Ashby-de-la-Zouch Canal passes briefly through Warwickshire from a junction with the Coventry Canal at Bedworth. The Oxford Canal, which runs from near Coventry and then eastwards around Rugby, and then through the rural south of the county towards Oxford. The River Avon is navigable from just north of Stratford. In 1974, the Higher Avon Navigation Trust made a proposal to extend the navigation to Warwick and Leamington, where a junction with the Grand Union Canal would create a new cruising ring. Warwickshire County Council believed the scheme to be a catalyst for economic regeneration in the area, but after gauging public support in 2003, decided not to support the plans. The Stratford and Warwick Waterway Trust is still actively pursuing the proposals. Warwickshire County Cricket Club play at Edgbaston. Notable players for Warwickshire have been Brian Lara, Bob Willis, Allan Donald, Geoff Humpage and Ian Bell. The Warwickshire County Board of the Gaelic Athletic Association (GAA) (or Warwickshire GAA) is one of the county boards outside Ireland and is responsible for Gaelic games in Warwickshire. The county board is also responsible for the Warwickshire inter-county teams. The play their home games at Páirc na hÉireann. Warwickshire Schools GAA Board was originally setup in September 2000. It has grown at a very healthy rate such that as of May 2007 WSGAA now work in partnership with 28 primary schools, 15 Secondary schools, 2 HE/FE Colleges and 5 local GAA clubs and in total an estimated 2385 young people. The aims of the WSGAA include competition by their elite team in the All-Ireland underage championships. This initiative is a remarkable departure from the traditional way in which British GAA clubs have been organised. Warwickshire has more Clubs than any other County within the Midlands, and has good representation at all levels of the game, and within the Administrative and Officiating Worlds as well. Old Silhillians Hockey Club is the Home of Warwickshire hockey, with many fixtures being played on the site, as well as the County Club Minis being played, Junior Academy Centres being coached, and meetings/County Officials being based at the Silhillians Sports Ground. There are 3 clubs who include the word "Warwickshire" within their names: Olton & West Warwickshire, Coventry & North Warwickshire, and Rugby & East Warwickshire, though it is not certain where these claims to regional areas within the County came from. Warwickshire as a hockey County is recognised by the England Hockey Board as the region normally associated with Greater Warwickshire, since the West Midlands is not a hockey region within the EHB world, and hence includes Solihull and Coventry as well as the standard regions. Warwickshire is perhaps best known for being the birthplace of William Shakespeare from Stratford-upon-Avon. Even today, road signs at the county boundary describe Warwickshire as "Shakespeare's County". The county has also produced other literary figures such as George Eliot (from Nuneaton), Rupert Brooke (from Rugby), and Michael Drayton (from Hartshill). The poet Philip Larkin lived in Warwick (born in nearby Coventry), and Elizabeth Gaskell went to school in Barford and Stratford. ^ "Warwickshire flag flying outside Eland House". Department for Communities and Local Government. 2013. http://www.flickr.com/photos/communitiesuk/5926144092/. Retrieved 2013-03-11. ^ "How the County Council makes decisions". Warwickshire County Council. http://www.warwickshire.gov.uk/Web/corporate/pages.nsf/Links/34FF93A8C745ABD480256CA70053C6F7. Retrieved 5 May 2010. This page uses content from the English language Wikipedia. The original content was at Warwickshire. The list of authors can be seen in the page history. As with this Familypedia wiki, the content of Wikipedia is available under the Creative Commons License.